I’m a fourth-year philosophy PhD candidate at University of Pennsylvania. I graduated in May 2014 with an MA in philosophy from New York University, and worked from 2014-2015 as a Research Associate with the Philosophy Group at Nanyang Technological University (NTU) in Singapore. My PhD is supported by NTU’s Humanities, Arts and Social Sciences International PhD Scholarship. After graduating, I’ll return to NTU as an Assistant Professor in Philosophy. My main research interests are ethics, and moral and social epistemology. My dissertation is an analysis of moral expertise and deference to moral testimony, and an application of general theories about these topics to the specific, real-world phenomenon of oppression. Amongst other things, I argue that experience generally has an important role to play in the development of moral expertise, because of its role in putting us in touch with characteristic clusters of morally relevant features. Although imagination is a useful moral epistemic tool, it is often a poor substitute for concrete experience with the real world. I also argue for various positive features of deferring to expert moral testimony in general, such as the fact that actions stemming from purely deferential moral beliefs can have moral worth. In the particular moral sub-domain of oppression, I argue that this is a clear case where first-personal experience of being oppressed puts one in an especially good position to acquire high levels of moral expertise on the matter. Analysing oppression also illuminates more reasons to defer to expert moral judgment, such as those related to epistemic injustice and moral encroachment on beliefs. Sitting on my dissertation committee are Errol Lord (chair), Lisa Miracchi, and Daniel Singer. My current research also cuts across normative, applied and meta-ethics, normative epistemology, standpoint epistemology, moral psychology, philosophy of emotion, and philosophy of imagination. I’ve also worked on moral decision-making procedures, food ethics, and philosophy of mental illness. In my non-philosophy time, I enjoy, perform and create music, and create visual art. My partner is a wonderful experimental electronic and jazz musician. Moral Deference, Moral Understanding, & Epistemic Injustice (May 2019). Annual SWIP-UK Conference on Epistemic Injustice, Reasons and Agency, University of Kent (UK). Deferential Moral Knowledge & Moral Worth (April 2019). Cyprus Metaethics Workshop, University of Cyprus (Cyprus). Morally Worthy Deference (April 2019). Great Lakes Philosophy Conference in Ethics, Siena College. Morally Worthy Deference (March 2019). Southeast Graduate Philosophy Conference, University of Florida. Moral Expertise & Traumatic Experiences (March 2019). Philosophical Engagements with Trauma Conference, UNC Asheville. Morally Worthy Deference (Feb 2019). Harvard-MIT Graduate Philosophy Conference, Harvard University. Virtuous & Worthy Moral Deference (Nov 2018). Penn Normative Philosophy Group, University of Pennsylvania. Deference to Morality De Dicto (Oct 2018). Mind-like Intelligence, Research, and Analysis Group, University of Pennsylvania. Moral Emotions & Imagination (July 2018). CEU Moral Epistemology Summer Course, Central European University (Hungary). Can Imagination Replace Reality for Sentimental Perceptualism? (July 2018). FRIAS Normative Epistemology Workshop, Freiburg Institute for Advanced Studies, University of Freiburg (Germany). 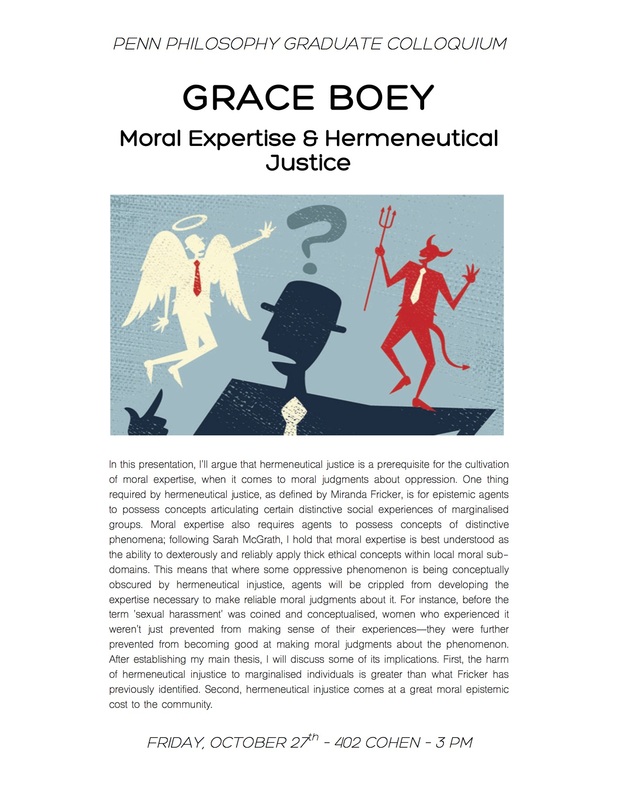 Moral Expertise & Hermeneutical Justice (Oct 2017). Penn Philosophy Graduate Colloquium, University of Pennsylvania. Expertise on Identifying Oppression (April 2017). Penn-Rutgers-Princeton Social Epistemology Workshop 2017, University of Pennsylvania. Using Race & Ethnicity in Humour: Ali Wong vs. Amy Schumer (Nov 2017). Philosophy and Film Series, University of Pennsylvania. Sexual Violence in Westworld: Glorification or Commentary? (Oct 2016). Philosophy and Film Series, University of Pennsylvania. Eyes Wide Shut and the Ethics of Monogamy (Feb 2016). Philosophy and Film Series, University of Pennsylvania. The Question of Mary Astell’s Feminism (Oct 2015). Workshop on the History and Philosophy of Education, University of Pennsylvania. Can we love animals and still eat them? (March 2015). Philosophy Club Speaker Series, Philosophy Group, Nanyang Technological University (Singapore). Invited participant to the Washington University Workshop in Ethics, Washington University in St. Louis (October 2018). Commentator for ‘Glued to the Image: A phenomenology of racialization through works of art’ (March 2017), by Alia Al-Saji. Minorities and Philosophy Conference: Global Feminisms, University of Pennsylvania. (Spring 2018) Teaching Assistant, Introduction to Philosophy, Michael Weisberg. (Fall 2017) Teaching Assistant, Ethics of Eating, Andrew Chignell. (Spring 2017) Teaching Assistant, History of Early Modern Philosophy, Andrew Chignell. (Fall 2016) Teaching Assistant, Ethics, Errol Lord. (Spring 2015) Guest lecturer (Philosophy of Religion), Introduction to Philosophy. (Spring 2015) Teaching Assistant, Philosophy for Everyone, Li Chenyang. (Fall 2014) Guest lecturer (Animal Ethics), Moral Philosophy. (Fall 2014) Guest lecturer (Philosophy of Mind), Introduction to Philosophy. (2014) Winner of the 3QD Philosophy Prize 2014. (May 2017) Should we outsource our moral beliefs to others? (April 2017) Given who we are, how should we listen to others? This page was last updated on February 27, 2019.